SAEOPP is in the middle of its annual membership drive. SAEOPP Membership Dues need to be submitted no later than October 31, 2010. It is important that anyone wanting to be a member of SAEOPP get their dues paid before October 31, 2010. Membership in SAEOPP has many benefits both for you the member, and it has lots of potential benefits for your students as well in the form of scholarships and advocacy as well. 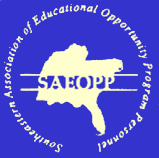 See the SAEOPP Membership Page for more information or for details about how to pay your 2010-2011 SAEOPP Membership Dues.